Powell Repair Technician Rachel Baker working on an overhaul. In a previous post here on Repair My Flute, we covered the topic of how one determines whether their flute needs a COA or an overhaul. You can read that post by following this link. The Overhaul involves the complete disassembly and reconditioning of an instrument. The time between overhauls is dependent on many factors, including climate and the quality and frequency of C.O.A.’s. A rough average would be three to five years. For a normal overhaul the labor charge is $1000.00 for flutes and $725.00 for piccolos, and the only parts cost is a set of pads. Expect to be without your flute for four weeks or piccolo for three weeks while it is being overhauled. Overhauls are warranted for 90 days. 1. The instrument is play tested and checked for all mechanical and structural work that will be required. The client will be contacted if the required work exceeds the authorized limit, and the charges will be discussed. 2. All pinned sections are taken apart; pads are removed and thrown away. 3. Corks, felts, foams and headjoint cork are removed and thrown away. 4. The flute is cleaned in an ultrasonic bath to remove dirt, oil and grease. The flute body and keys are then dipped in a tarnish remover. 5. Swedging, replacement of worn pins, and key fitting, as well as required mechanical and bodywork are done, as per findings in #1 above. 6. 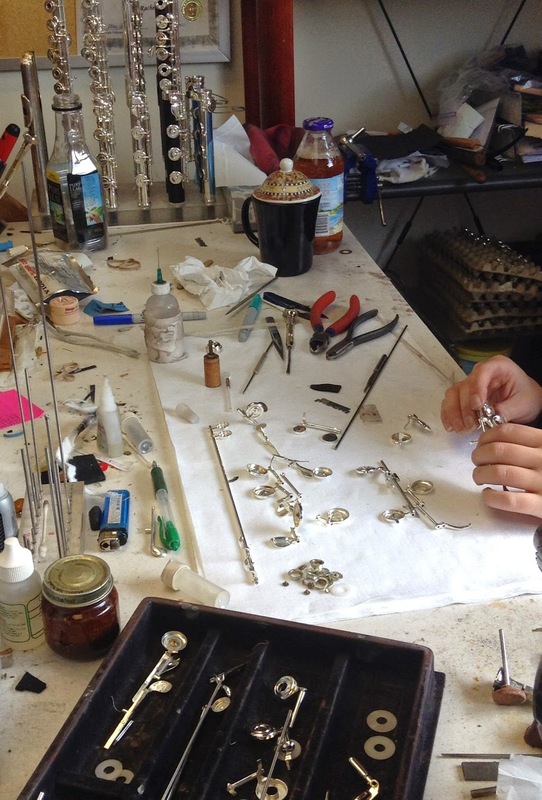 The precious metal parts are shined and treated with silver polish. 8. Corks, felts and foams are attached. The headjoint cork assembly is polished and a new headjoint cork is installed. 9. The keys are oiled and assembled. 10. During the final padding process the instrument is played frequently so that pads can settle. Adjustments are made. 11. The instrument is play tested. 12. The instrument case is cleaned and polished, then shimmed (if necessary) so that the instrument fits snugly. Exclusions: The removal of scratches, nicks and dents is done only at the client’s request, and is charged by the hour. A bearing job may be required if the right and left hand sections exhibit side play in the F# post at the cost of $213.00. Re-soldering of un-soldered tone holes is charged by the hour. You may schedule an overhaul directly through the Powell website. Click here to visit the repair scheduling link.